The Political and Policy Director is a key leader of CEJA and CEJA Action who will scale the power of the Alliance in advancing policy and civic engagement goals and furthering CEJA Action’s electoral program. The position requires policy advocacy experience, leadership and visionary qualities, the ability to develop a multi-pronged strategy, and a commitment to environmental and social justice. The Political and Policy Director partners closely with the Executive Director and Program Director to develop and implement an integrated, cohesive power-building strategy for systemic change through impact policy to improve the health and well-being of environmental justice communities. The ideal Political and Policy Director is someone with significant experience with policymaking and strategic policy advocacy campaigns. This position will be a trusted, reliable, and respected representative of CEJA with decisionmakers and partners. This position requires an excellent strategic thinker, planner and implementer, who is an effective communicator with the ability to guide multi-disciplinary program and policy priorities. The fiscal sponsor for CEJA is the Environmental Health Coalition (EHC), a member of CEJA. The Political and Policy Director will be an employee of EHC and will report to the Executive Director of CEJA, and will directly supervise two program staff. The Political and Policy Director will be housed in one of CEJA’s offices in downtown Sacramento, Oakland, or Huntington Park in Southeast Los Angeles County. Serve as CEJA’s primary policy and political strategist and expert. Advocate before state legislature, executive branch, and regulatory agencies, as necessary. Represent CEJA externally and further relationships with a variety of decisionmakers and stakeholders including, but not limited to, elected officials, unions, environmental and social justice organizations, funders, media, and key political tables. Participate in meetings and networks to advance policy and civic engagement goals. Oversee, guide direction, and strengthen the planning and execution of CEJA’s Building the EJ Voice in State Policy, Civic Engagement, and Electoral programs. Partner with the Program Director to leverage connections across different programs, including intersecting projects and policies, to cohere andalign program priorities with overall organizational goals and mission. Oversee development of strategic activities to advance our policy efforts, including identifying additional needs for successful campaigns, such as key reports, research, communications needs, and helping to identify key targets, power mapping, etc. Direct and conduct policy analyses of regulatory and legislative proposals, and develop strategy, as necessary. Oversee and build CEJA’s Civic Engagement and Electoral programs to ensure they align with CEJA’s and CEJA Action’s broader strategy. Provide high-level strategic advice to Executive Director and Advisory Committee on electoral development including long-term strategy and growth, targeting electoral, legislative and ballot initiative opportunities. Manage long-term strategic thinking on how CEJA can use political and electoral engagement to build sustainable power in environmental justice communities. Identify, develop, and implement training tools for membership to strengthen their analyses and advocacy skills. Serve as lead thought partner, mentor, and supervisor for Policy and Civic Engagement managers to guide and support policy and political objectives, strategies, and activities. In partnership with the Program Director, strengthen annual program evaluation and planning with guiding framework and processes to ensure consistency and overall coherence across program areas. Ensure Building the EJ Voice in State Policy, Civic Engagement, and Electoral Programs have ambitious and attainable goals and plans in place; provide clear and useful feedback; and serve as a resource to CEJA’s program managers, including on issues related to the management of their program committees. Oversee budget development and administration for Building the EJ Voice in State Policy, Civic Engagement, and Electoral programs. Work with Communications Manager to integrate strategic communications to advance legislative and electoral goals and strengthen CEJA’s capacity to execute timely, consistent, sharp, relevant, and aligned narrative interventions. In partnership with Program Director, develop and manage systems for communication, coordination and strategizing within and between programs. Support Executive Director in strategic organizational development, including participation in regular Leadership Team meetings concerning organizational matters. Serve as representative and spokesperson for CEJA at major events, preparing, assisting with, and/or providing presentations. Implement and oversee performance evaluation and management systems. Support organizational leaders in hiring, coaching, and retaining high performers, and in addressing performance issues. Play a key role in supporting CEJA and CEJA Action’s fundraising success by informing development of proposals and reports, ensuring successful execution of grant agreements and other fundraising opportunities as needed. Build and cultivate relationships with funder partners, including providing relevant and timely reports on developments and achievements. Build and foster strategic relationships with member, partner, and ally organizations. Support Executive Director in establishing and refining internal cultural norms, management practices and systems, and ensuring staff development. Assist Executive Director with planning Steering Committee meetings, and present and report on program progress at CEJA Steering Committee meetings. Foster an environment that promotes trust and cooperation amongst CEJA staff, community members, and affiliate organizations. This position requires travel to Sacramento, the Los Angeles Area, and the Bay Area as needed, and occasional travel to the offices of CEJA member and partner organizations. Deep commitment to Environmental, Social & Economic Justice, and CEJA’s mission. Familiarity with California political landscape and community and advocacy groups. Successful track record of at least 5-7 years in policymaking, advocating through the legislative process, and political strategy development. Strong research skills and general Internet fluency. Knowledge and understanding of how to build grassroots and political power through base-building, civic engagement, and movement building. Leadership and communication skills (both written and verbal) with the ability to facilitate understanding across multiple audiences. Experience leading fast-paced, collaborative policy campaigns, and ability to handle multiple tasks and maintain attention to detail. Effective strategic planning, program evaluation and project management skills. Embodies self-confidence and ability to create and advance a complex agenda. Ability to work flexible hours to respond to position needs. Public Policy, Law, or other similar degree. Background and policy expertise in energy and climate justice. Strong working knowledge of Microsoft Office Suite (Word, Excel, Power Point). Leadership, coordination, and facilitation skills and experience. Ability to develop a team-oriented environment; commitment to democratic participation. Starting Salary: $77,000-85,000, depending on experience. Benefits: Health, dental, & vision insurance, retirement plan, generous vacation & sick leave. Deadline & Start Date: Position is open until filled, with a start date as soon as possible. Applications: Email resume with cover letter to: jobs@caleja.org. In the subject line, put the words Political and Policy Director followed by a dash and your last name, first name. Environmental Health Coalition is an equal opportunity employer. 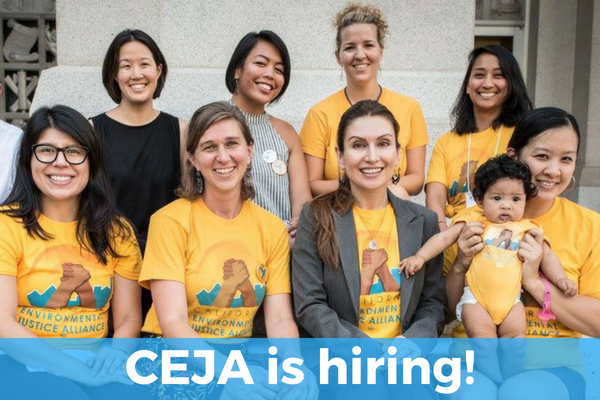 CEJA seeks a dynamic Program Director to oversee the development and operation of CEJA’s Climate Justice, Energy Equity, and Green Zones programs. The Program Director will develop and guide the implementation of a broader framework and coordinate across program areas to cohesively maximize effectiveness. This position will identify and support policy analyses, research and content development, and training needs. The Program Director will work closely with program staff and the Political & Policy Director to ensure effective development and implementation of our program priorities and campaigns. This position will also identify and develop tools and practices to further equip and empower our membership to deeply engage in our program work. The fiscal sponsor for the California Environmental Justice Alliance is the Environmental Health Coalition (EHC), a member of CEJA. The Program Director will be an employee of EHC. The Program Director will report to CEJA’s Executive Director and will directly supervise three program staff. The Director will be housed in one of CEJA’s offices in downtown Sacramento, Oakland, or Huntington Park in Southeast Los Angeles County. Serve as lead thought partner, mentor, and supervisor for Energy Equity, Climate Justice, and Green Zones program leads to provide visionary guidance for programs. Oversee the program leads and, in consultation with the Political and Policy Director, develop analyses, strategies, and tools to advance program workplans, campaigns, and policy advocacy for Green Zones, Energy Equity, and Climate Justice programs. Oversee, guide direction, and strengthen the planning and execution of these three programs, leveraging connections across, including intersecting projects and policies, and aligning priorities with overall organizational goals and mission. Guide development of strategic activities to advance program goals and workplans, including identifying additional needs for successful campaigns, such as key reports, research, communications needs, and helping to identify key targets. Manage long-term strategic thinking about how CEJA and its members can effectively advance its program campaigns and goals toward a Just Transition. Serve as a lead CEJA representative, cultivating and furthering relationships with a variety of decisionmakers and stakeholders, including elected officials, labor unions, environmental and social justice organizations, funders, and the media to advance program agendas. Participate in relevant coalitions, networks and events to advance program goals. Advocate before state legislature, executive branch, and regulatory agencies, as necessary. Direct and support policy analysis of regulatory and legislative proposals, as well of development and execution of program activities. Serve as liaison with consultants and oversee consultant agreements for the Green Zones, Energy Equity, and Climate Justice programs. In partnership with the Political and Policy Director, strengthen annual program evaluation and planning with guiding frameworks and processes to ensure consistency and overall coherence across program areas. Ensure Energy Equity, Climate Justice, and Green Zones programshave ambitious and attainable goals and plans in place; provide clear and useful feedback; and serve as a resource to program managers, including on issues related to the management of their program committees. Oversee budget development and administration for Energy Equity, Climate Justice, and Green Zones program. Work with Communications Manager to integrate strategic communications to advance program goals and help strengthen CEJA’s capacity to execute timely, consistent, sharp, relevant, and aligned narrative interventions. In partnership with Political and Policy Director, develop and manage systems for communication, coordination and strategizing within and between subject matter programs and policy and civic engagement programs. Implement and oversee staff performance evaluations and development. Support Executive Director in strategic organizational development, including serving on and participating in regular meetings with Leadership Team. Serve as representative and spokesperson for CEJA at major events, preparing, assisting with, and/or providing presentations as related to program areas. Support Executive Director in hiring, coaching, and retaining high performers, and addressing performance issues. Play key role in supporting CEJA’s fundraising success by informing development of proposals and reports for Energy Equity, Climate Justice, and Green Zones programs, ensuring successful execution of grant agreements and other fundraising opportunities as needed. Build and maintain relationships with funder partners, including providing relevant and timely developments and achievements. Build and foster relationships with existing and new members, partners and allies. Support Executive Director in establishing and refining internal cultural norms, management practices and systems. Provide high-level strategic advice to Executive Director and Steering Committee on program development, including long-term strategy and growth. Assist Executive Director with planning Steering Committee meetings, and participate and provide presentations to Steering Committee as necessary. This position requires travel. The Program Director will travel to Sacramento and Oakland on an as-needed basis and will make occasional trips to the offices of CEJA member and partner organizations. Holds a deep commitment to Environmental, Social & Economic Justice and CEJA’s mission. Familiar with California EJ policy landscape, community, and advocacy groups. Ability to successfully navigate and advocate before various policy decision-making venues. Embodies self-confidence and the capacity to be a lead thinker and strategist in program development. Background and policy or program expertise in environmental justice issues. Experience leading fast-paced, collaborative program and policy campaigns, and ability to handle multiple tasks and maintain attention to detail. Public Policy, Urban Planning, Law, or other similar degree. Successful track record of at least 5-7 years in: supervisory experience, and comparable policy/legislative program/campaign experience. Deadline and Start Date: Position will remain open until filled, with a start date as soon as possible. Applications: Email resume with cover letter to: jobs@caleja.org. In the subject line, put the words Program Director followed by a dash and your last name, first name.